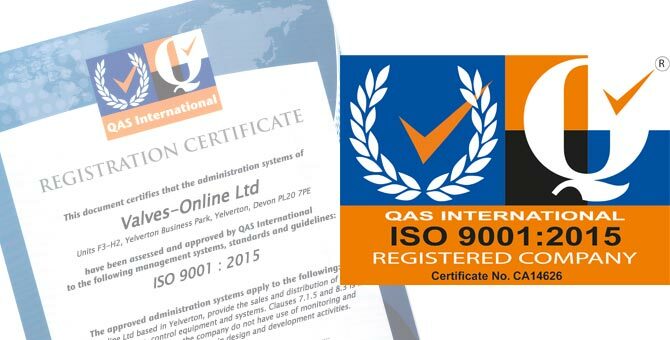 Valves Online continues to demonstrate its commitment to quality and customer service with certification to the new ISO 9001:2015 management system standard. 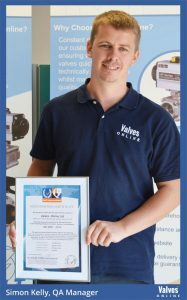 Simon Kelly, QA Manager at Valves Online is proud to announce that following a recent audit we have achieved certification to ISO 9001:2015. ISO 9001 is the internationally recognised standard for the quality management of businesses. Our administration and management systems have been assessed and approved by QAS International since 2014, and have in previous years been certified to ISO 9001:2008 management systems, standards and guidelines. This year we have achieved certification to the new ISO 9001:2015 certified management system standard. At Valves Online, we take quality seriously and believe it to be very essential, which reflects in our products, our services and our people. To achieve our objective meeting our customers’ expectations, Valves Online and its sister divisions (Select websites and Tecnica Europe) are totally committed to implementing and maintaining the Quality Management System based on ISO 9001:2015. As quality problems occur they are identified and solved efficiently with speed, accuracy and technically sound practice. Read more about our commitment to ISO 9001:2015 or download a copy of our new ISO 9001:2015 certificate here.